Choosing the best fish finder can be quite challenging given the many models and brands of fish finders available. It requires tact and knowledge of the basics of the industry to buy the best fish finder that meets your individual needs and fishing style. When choosing the best fish finder, you should consider the amount of fish you intend to catch. Will the finder help you locate more or less fish? To avoid the hassles faced when buying this great finder, you should read through this buying guide. It will enable you to understand more about fish detector features and what to look out in the market. A fish finder is an instrument designed for the specific purpose of detecting fish in water. The finder detects reflected impulses of the sound energy. The information about the electronic pulses reflected off the fish is displayed on the screen of the fish finder in graphic rendition. The units of the fish finder also help in measuring the depth of the water, locating the marine debris and the bottom structure. The fish finder can just indicate one fish in the form of small icons with several arches. The availability of a best fish finders’ brands, models, and types can confuse you when choosing an appropriate best fish finder. The reviews of different models compiled here that are rated among the best fish finder models in 2019. These reviews will help you understand the features of the best fish finders before making the purchase. You don’t want to buy a fish finder that will worsen your fishing experience. That’s why we recommend prior research before hitting the market. Be sure to get invaluable information about the models, rating and best sellers with this buying guide. 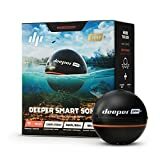 10 Best Fish Finders Reviewed! Raymarine Dragonfly 4 Pro is one of the best fish finders that comes with a sonar/ GPS combo with a downVision conventional sonar that allows you to locate fish deeper in the water. The finder is bonded for displaying sharp colors, wide viewing angles and doesn’t have internal fogging as is the case with other poor quality finders. The device also comes with coastal maps help you locate your location along the US rivers and lakes. The micro-SD allows you to save the screenshots of your best catch and share it with friends using the WI-fish mobile app. The Wi-Fish also helps you rewind, save and share your expeditions on social media. Dragonfly combines the GPS navigation with the advanced dual channel CHIRP sonar to give explicit guidance and easily identify fish and underwater objects. The gadget has a 4.3’’ all weather high definition Led display enabling the Fisher read the screen while fishing at night. Enhanced GPS navigation and Raymarine tracker help you track your location and reduces the chances of getting lost. It has a bright touch screen that doesn’t fog up during fishing. The Wi-Fish app helps your family to know your location and share in your passion. You also need to have a basic understanding of the nautical measurements because of the Raymarine’s advanced system. The use of GPS requires you to practice thoroughly to understand the basics. Too much practice hinders sufficient concentration on fishing. The portable fish finder is the smallest portable personal sonar fish finder available on the market today. The wireless finder syncs with the free app on the phone enabling you to carry it everywhere you go fishing. 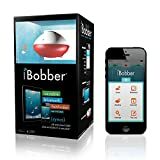 The free app allows the syncing of iBober via Bluetooth and allows you to log water depth and temps, map waterbeds, mark spots and add photos and species in the fishing expedition. The gadget has patented sonar fish identifier technology that provides enhanced readings 0f the fish, depth, contours, and structures under the water. It combines a lot of technology in one device. IBobber is the perfect tool for fishing situations that depend on size and weight such as canoeing and kayaking. The LED beacon makes night fishing hassle-free and is essential for ice-fishing or during foggy seasons. iBober’s large contracts design enhances visibility when fishing in bright outdoor lighting. The app’s anti-glare setting aids the Fisher to see the screen when experiencing problems. The patented fish finder also displays the fish according to size and depth thereby guiding you to fish with precision. It’s essential in finding panfish, largemouth, salmon, walleye, pike, trout, smallmouth and other types of fish located as deep as 135’ from the boat. The trip log and the social media sharing options help you to track the date and time of the fishing expedition. It also provides you with an opportunity to share your location and adventure with your family and friends. The apps have a trip-log option that allows you to gather information about the number of fishes caught. Superior sonar technology allows you to detect fish of every size with a color code which scans at an angle of 120-degrees. The device is very useful in getting smallmouth and largemouth fish. The device experiences problems with Bluetooth connection in some cases. The app might disrupt the normal functioning of your phone battery in some cases. Deeper pro plus Fishfinder provides you with an opportunity to fish from anywhere be it a boat, from the shore or even in ice. The smartphone fishfinder is compatible with both tablets and smartphones, and it allows you to view the sonar feedback on the same mobile device, the downloadable app provides other features such as Solunar Forecast calendar, for forecasting the weather, fish notes, and other unique features. The device operates on a free Wi-Fi connection, thereby enabling you to use it anywhere so long as it’s charged. There are some places on the sea or lake where you can’t get a network signal. You shouldn’t worry about such cases anymore because the device will still work and help you connect with friends and family. The device emits its own Wi-Fi field, which is a tremendous improvement from the original machine that depended on Bluetooth. Wi-Fi provides for stronger connections, and therefore fewer disconnections during use. Deeper pro models have a greater Wi-Fi connection of up to 100m as compared to the 42 M Bluetooth range provided by the original deeper model. This sonar is wireless and can, therefore, be used anywhere. You can fish in the pond, lake ocean or even river with this device. It works better in deeper water. It also boasts an extended battery life of about five and a half hours long. Deeper pro plus works better in both salt and fresh water. Additionally, it comes with a reliable GPS that helps you track your location and the distance from land. Has its free Wi-Fi thereby saving your data charges. When connected to your mobile device it will show color sonar picture of the fish or objects underwater. 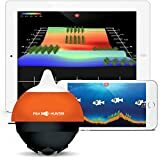 Fish Hunter 3D is a portable fish finder that uses technology to help you catch as many fish as you can. The device uses a high frequency has 3D mapping features and uses Wi-Fi as opposed to Bluetooth used by other fishfinder devices. It has powerful Tri-frequency feature that enables it to cover a larger area. The frequency used is about 381,455,675 KHz. It has an ultra-resolution that works five times faster in a bottom coverage area than any other device. The 3D fish finder comes with super sonar views The Wireless Sonar is available and aids the device in 3D contouring, 3D bottom mapping, and directing ice fishing flasher view thereby helping you get a clear picture of the fish and fish as many as you can see. The 3D mapping feature will help you get proper fishing area especially areas where trees are inside water. Areas with many trees harbor more fish than areas without trees, because of the availability of food and oxygen. This fish finder has a long connectivity range and can cover almost 45 m of jig tracking and up to 50m of ice-fishing depth. The Wi-Fi connectivity of the 3D portable fish finder enhances the speed of connectivity to about four times more than Bluetooth. The fish finder is easy to use and can be used in different environments including from a shore or a boat. It’s long range feature activity helps you get more fish within a short time. It’s more user-friendly and can be used anywhere. The 3D feature is not as important as a map because everything under the water seems the same. The hummingbird Helix Di-GPS fish finder has unique cartography that locates areas with a high density of fish. Fishers can easily get much fish by following the location as indicated by this device. This device is one of the latest products from the hummingbird series. It has CHIRP capabilities which enable it to integrate Dual Beam and down imaging. It comes with a plus sonar together with accurate GPS for easier tracking. The uni-map base chart helps you know the mapping of the fishing area. The SI and DI sonar functions lack super depth capability, and therefore it’s basically used in fresh water. The device can also be used off-shore with the use of its Dual Beam Plus sonar application. Its transducer covers all the sonar functions, has an efficient GPS in addition to quality charting capabilities. Offers down and side scanning features which enable the Fisher to scan all parts surrounding the boat for fish. Has an inbuilt GPS which is essential in tracking the movement and location of the vessel. It tracks the fishing progress quickly. Fishing has undergone revolutionary changes courtesy of the advancement in technology. Modern fishing is hassle free and enjoyable thereby assuring the fishermen of quality results. This device has unique features that make it super as compared to other fish-finding and nautical navigation system. This model has a high-resolution display of 480×480. Its screen has a diameter of 5 inches, which is ideal for an onboard structure. This device ranks as one of the perfect choices for professionals and those who enjoy fishing as a hobby. The device comes with a bright LED and a backlit keypad which makes it convenient to use at any time of the day. The device also has a transducer that can be easily mounted to the hull in any desired style. It produces excellent picture quality thus enabling the Fisher to get a clear view of what lies beneath the boat. It differentiates between the species and structure correctly. The device has free software updates which keep it updated. Its features are advanced even after the purchase. Garmin Striker 4cv comes with a waypoint map that allows you easy viewing, marking and navigating, identifying items like docks, stumps and brush piles. The device has an informative display that shows the info about GPS heading, GPS speed, distance from the point of origin and towards the destination, time of arrival and bearing among others, the display also shows images in color. The device also enables you to check the trolling speed on the screen. The CHIRP sonar technology avails you many frequencies for a varied range of information. It creates fish arches and enhances target separation which improves your ability to catch fish. The flasher helps you uniquely view data. It also comes handy in ice fishing and vertical jigging. Its frequencies find fish, marks them and returns to hot spots, docks, and slipways. The CHIRP technology used on this device has a powerful transducer which enhances a clear fish detail as compared to traditional sensors. The CHIRP sends many frequencies and interprets the results differently. This feature enables you to get a more reliable image and a clear view of what passes beneath the boat. The transducer of the latest 4cv model has both the first Garmin Chirp sonar and the new CHIRP cleave scanning sonar. The device is suitable for use both in fresh and salt water. The device has an advanced transducer that is capable of both conventional dual beam sonar and DownVu. The transducer uses a high 500-watt power output thereby allowing the sonar to remarkable depths. It is perfect for deep water fishing because it has a depth capability of 2300 feet. The Garmin echo 551 dv has a sonar that is essential in separating the bottom structure from the targeted fish. The DownVu scanning gives clear photo-like images of the structure and the fish in water. It also backs dual beam sonar with 77kHz and 200 KHZ. 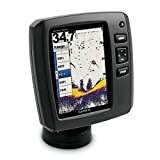 The Garmin Echo 551dv fish finder has a 5-inch display with a pixel resolution of 480×640. It provides bright and clear images that show clear differences in details such as fish arches and bottom structure. You can either view the output on the screen vertically or horizontally. Both options have a zoom feature that enables you to get a clear reading of the sonar results. The screen view function allows you to view different sonars at the same time, thereby providing you access to vast underwater detail. Other features include an ultra scroll for targeting fish arches when the boat is at high speed, a bottom lock for showing the returns from the bottom and displaying the base, advanced smooth scaling technology designed to give a seamless transition from shallow to deeper water and vice-versa. It also has an A-scope that shows the fish passing through the transducer beam and an adjustable depth line that indicates the depth of the objects under the boat. The AutoGain technology helps you to adjust the viewing of the fish and maximizing targets. The Humminbird fish finder comes with a 7-inch display that has a pixel resolution of 800x 480. It enables the user to see clear images of the objects under water. You can quickly detect arches and other objects under the water. Its aspect ratio allows you to get a wide angle view of things under water. The display glass is bonded thereby minimizing the glare and ensuring the unit can be used during the day hassle-free without unnecessary straining to get a clear view of the screen. It provides the best visibility when in the sun. Its LED backlit display offers enough light which ensures the onscreen data is readable. The fish finder also has IPX7 waterproof level which protects it during a rainy fishing day. The waterproof feature means that the device will still work well when submerged in one and a half depth of water. It’s however advisable always to keep the unit dry. The extra RAM feature complements with the processor within the unit thus providing enough space for processing the saved images at a faster rate. It also enables users to experience higher sonar rates. The uploaded images are displayed quickly without unnecessary buffering as is the case with other fishfinders. Additionally, the unit has GPS capability and a Micro SD Card slot. Micro SD cards enhance the transferability of data from one medium to another. It displays bright images due to its 7-inch color display with an 800×480 pixel resolution. It is very costly and thus not affordable to everyone. The Raymarine Dragonfly 7 Pro is among the most recent inventions in the field of fish finders. It has Familiar CHIRP technology that passes signals through the water. The dragonfly can also interpret and return better signals than any other device. It’s structured to display with enhanced clarity and detail. The display comes with the latest optical-bonding LCD technology that features brighter colors and all-weather performance. You can get high-quality images of what is under the boat both fresh and salt water as deeper as 180 meters. With this device, you can easily track and avoid hitting the underwater obstacles in the shallow water. It has an inbuilt GPS which helps in mapping and tracking of the position. It’s Wi-Fi enables you to stream data from friends or saves on your mobile device for further reference. The device can be mounted on a boat or carried along due to its light weight and smaller size. Has clear images due to its broad spectrum of frequencies. It enables you to differentiate between predator fish, target fish and other objects under the water. Has multi-language feature making it easy to use in all parts of the world. Has an all-weather feature making it ideal for use in all types of weather. It has a short cable. You will need to buy another extension cable when using it in big boats. Shipping Restrictions – The shipping can only be shipped within the US. There are many types and models of fish finders available in the market. As so it can become quite challenging and time-consuming to find the right model to purchase. You need to carry out thorough research so that to know the best type of fish finder. Below is best fish finder reviews of the models that are top rated today. These reviews will guide you in identifying the right fish finder for your method of fishing. To ensure that you get the best device, it is essential that you read these reviews and comparisons so that to decide on the right model. This is a sonar instrument that is made specifically to detect fish underwater. The fish finder detects reflected impulses of sounds. All the reflected electronic impulses are converted into information which is then displayed in a graphic on the screen of the machine. Also, these units measure the depth of the locating underwater debris, water, and the bottom structure. The Picture that is typically found on the screen of the device can represent one fish that is in the form of a small icon. Nowadays there are many fish finders and types of fish locator that have come to the market. Therefore, it becomes difficult to know the right unit to meets your style and needs. You need to be very careful when buying so that not to make any mistake that might cost you a lot of money. The first thing that you are required to put into consideration is whether the tool will help you to catch a lot of fish. To reduce the hassle that comes with buying a new gadget, it is essential that you consider factors such a Transducer, power, display, portability and frequency. Below are several factors that will guide you in purchasing the best fish finder. The display is a very crucial factor that you need to find. It is all about pixel since, if you have more pixels, you will be able to see more details. For to you to get a sharper image and good resolution, you will need to invest a lot of cash. The displays of these devices come in different sizes. For instance, a bigger screen is likely to give you a clearer and good picture. It is also easier to differentiate on it all the information that usually displayed like numbers and echoes. Also, you can decide to choose either color or black and white depending on your budget. If you are working on a tight budget, then black and white will work for you. The importance of color screen includes easier viewing of the screen in bright light, showing greater details many colors and simpler way of viewing what is underwater. When buying a fish locator, you need to purchase the unit that has the right frequency. The frequency is closely related to the angle of the cone. On Most transducers, you are likely to find frequencies such as 50, 83,192 and 200 kHz. High frequency will provide you with more detail on the screen. Thereby, you need to choose a model that has a higher frequency. You can look for units that have dual, single or multiple frequencies. This is the major part of the fish finder. Transducer works by sending sound waves and detects what is in the underwater. The sonar sound that it sends into water is then picked up by the transducer. This signal is later translated into an image. An essential feature in the transducer is cone angle. Selecting a wider cone will offer you a wider coverage of underneath water enabling you to locate more fish. Power is an important feature that you need to look out for before purchasing a fish finder. The power measure of these devices is watts. When the unit has a higher wattage, it becomes more efficient and provides a better speed of showing readings. When working on shallow water, you can consider using a device with less wattage. AS such, if you are planning on fishing in deep waters, it is recommendable that you look for more powerful units. When choosing a fish locator, it is always your choice to pick a portable or a fixed unit. However, buying a mobile unit is a better option if you like ice fishing. The portable unit comes with their carrying bag and battery power supply. The device comes with a transducer that is usually attached to the transom. On the other hand, a fixed unit will work well with the watercraft owners and settled fishers. 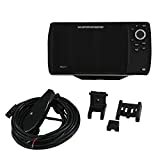 If you are looking for a powerful and advanced unit, then consider choosing Humminbird 698ci HD fishfinder. This unit offers a high resolution backlit display, powerful side imaging technology and 2D sonar frequencies that power and ability to provide readings up to 1500 ft. It has the power output of 400 watts [peak to peak] and 5oo watts. It also has an internal GPS unit that provides both chart plotting and GBS tracking. The unit comes with UniMap cartography and a card slot that contains a selection of optional maps. The split screen available enables easier viewing of sonar and charts at a go, making it simple to navigate while fishing. For those who enjoy ice fishing, one of the top rated and recommended fish finders is the Humminbird ICE-35. It contains zoom flexibility which is one of the most liked features. This enables you to zoom for more detail in any part you select of the water column. It has features such as dual frequency, maximum 200 depth capability and 800 watts [peak to peak]. If you are looking for a portable device that does not cost much, then this is the best option. This tool is easy to use and also quite innovative. It is made to be able to provide readings of fish, weeds, and structure to as deep as 100ft. The negative side of this device is that it does not draw a picture but only detects an image that provides fish. It is tiny, and so it can fit well in the palm of your hand. Due to its portability, there is no mounting of the unit required. 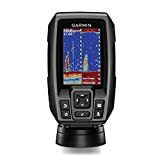 This one of the most advanced and higher priced fish finder in the market. The higher cost of this unit gives you many features that may be very beneficial. It features 7-inch bright LED backlit LCD for crystal clear pictures. It has down imaging for identifying cover and structure and switch fire that allows locating and targeting fish. The HD Side Imaging assist scanning the area of up to 240 feet deep. It has Internal GPS that help in chart plotting. In this era, the effects of technology can be felt in almost every industry. Advanced technology can be experienced even in fishing about modern fishing equipment. A fish finder is a perfect example of the technological advancement in the fishery. Fish finders are electronic devices that are very helpful during a fishing excursion because they help find more fish within the shortest time possible. A fish finder is a fantastic tool that can be beneficial to a beginner as well as professional fishers. Here are some of the reasons why you should use a fish finder the next time you go fishing. If you are a bigger, one of the possible challenges that you will face when fishing is locating fish. With a fish finder, determining the location is not a big deal since you can see the location of the fish you want underwater on a big screen. Boats that have fish finders installed will help you determine the presence of fish quickly. With a tool of this kind, locating a school of fish is not tough. Before placing bait underwater, the first thing that you should think about is determining water depth. You want to be sure that you drop your bait in the correct location underwater. A fish finder will help you do that and assist you in fish in the deepest part of the sea. Many people are excited with the catch. At times, it’s hard to know the size of your catch because you can’t see inside the water. However, the screen of a fish finder allows you to guess the size of fish when it is still underwater. Therefore, you will get home with your target fish. Considering the number of fishes that a school has is almost impossible. With a fish finder, making that assumption is something that can be done without strain. Assuming the number of fish is possibly the best thing that you can do before you start fishing. Check on the screen of the finder to see the number of fish where you have or are about to place your bait. Many fishers don’t know the speed of the wave, but with a finder that has a GPS, it is possible to understand waves. Understanding the speed and turn of wave help avoid hassle during fishing. Fish finders are designed in a way such that you will get wave alert even from a longer distance. Also, you can determine the temperature of the water if your finder is GPS enabled. Answer: This is the primary part of the fish locator. It operates by sending sound waves and showing what is in the underwater. The sonar signal that is transmitted by the transducer bounces off of the objects that are underneath the water surface then picked up by the transducer. This signal is later translated into an image. Why is portable fish finder beneficial? Answer: Portable fish locators are helpful since they are not bulky and so can move with them from one place to another. They normally come with their carrying bag and battery power supply. Portable units have a transducer that is already attached to the transom with the help of suction cup. The power measure of fish finder unit is? Answer: Power is an essential feature that should be highly considered when buying a fish finder. Power in these devices is measured in watts. When the unit has a higher wattage, it gives better efficiency and better speed of displaying reading. Give an example of a portable fish finder? Answer: One of the most popular portable fish finders is Norcross HawkEye F33P. It is an innovative device which is so easy to use. It is also a well-designed unit for beginners. Like any other activities, fishing is a great activity, and you can easily engage in with your friends or family. It is therefore important to ensure that you get the right units and equipment that will improve your fishing experience. If you are planning on fishing, it is advisable that you consider buying a fish finder. It provides anglers that have many advantages. Make a point of going through the review that I have listed above. In the review, I have listed the fish finders that are most popular. All the reviews contain ratings and positive feedback from the users. Depending on your needs one type of fish finder might be the right choice for you. There are various factors such as budget and others that you should take into consideration. Before you make any purchase, you need to know whether you require a portable device or a fixed unit that is mounting your boat. You may also require asking yourself whether the fish locator is sufficient for your needs or you need integral GPS in the unit. I hope that with all the information that I have provided you will get the best fish finder that suits you best. You may like to have a look at our top 10 best fish finder GPS combo review.